Que: Bihar is the -- largest State of India according to Census 2011. Que: Asia’s Biggest Cattle Fair held at which of the following city ? Que: Which is the official language of Bihar? Que: Where is Industries Commissioner Office of Bihar situated? Que: State bird of Bihar ? Que. Which of the following state is bordered south to Bihar ? Que: Valmiki National Park is located in which district of Bihar ? 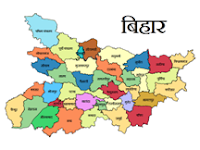 This page will deals with Bihar Current Affairs GK question answers that means student of Bihar state can get their latest General Knowledge question on their states, villages, cities etc. Read these Bihar General Knowledge Objective Questions and Answers with explanation and Bihar GK & Current Affairs 2016 for State Competitive exams,entrance exams and Job interview. Read many objective multiple choice questions of Bihar -G.K. pdf in Hindi. Practise online thousands of questions related to Bihar G.K.. You can check online answer and try mock tests for Bihar - G.K. Questions provided in Hindi.